A team of Hollywood screenwriters couldn’t have scripted things any better. Weekly stock car racing has long been considered a family tradition, with a passion for the sport handed-down through the generations. The Orono, Ontario based father and son duo of Craig and Brandt Graham has continued this time-honoured trend. While Craig was plying his craft and earning season championships at the controls of asphalt racing machines in the Challenger, Thunder Car and Limited Late Model divisions, Brandt began his racing education in go-karts and Mini Stocks, before earning the 2016 and 2017 title on the Lucas Oil Sportsman Cup Series. For the 2018 campaign, the pair is spending their racing time together in the Pro Late Model and Canadian Modified classes respectively at Brighton Speedway. Saturday, June 16th, each racer scored the best finishes of their dirt racing careers. After having his #98 machine almost completely rebuilt following an early season rollover, Craig Graham was 3rd in the final Pro Late Model feature running order. 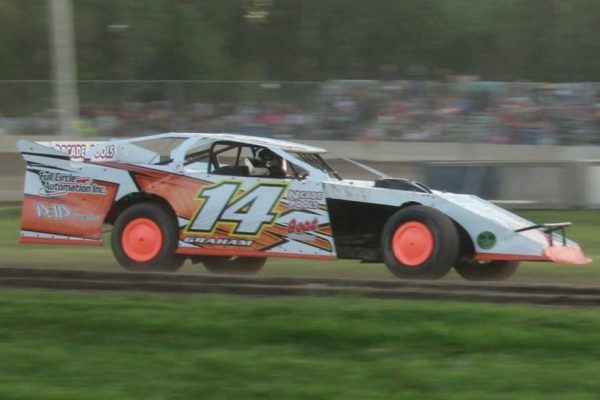 Brandt Graham – a rookie in the 3rd of a mile clay oval’s open-wheeled ranks – finished 4th in the night’s ‘A’ main. The fact that both strong efforts came on Father’s Day weekend isn’t lost on the proud parent. Graham says the team also appreciates the effort and hard work of Ted Stacey, Rick Rowe and Ian Graham. Without their help, it wouldn’t be possible to run 2 cars on one night at the same track. Brandt Graham recorded a career best dirt track finish of 4th in Canadian Modified action – Saturday, June 16th – at Brighton Speedway.